Three Things You Should Know about VOIP - We Simplify Communications! Voice Over Internet Protocol (VOIP) is the phone system of choice for small, medium and large businesses. With VOIP phone systems, you can save costs from hardware and infrastructure investments as well as increasing sales. The more you scale up, the more savings. Whether you are a small or mid-size business (#SMB) or an enterprise size organization, you don’t need to invest in equipment. There are no requirements of phone lines, handsets, or branch exchanges. The more you scale up, the greater your savings. Tie in your phone to email, instant messaging, and social media. When working with your smartphone, integrate these applications and more. 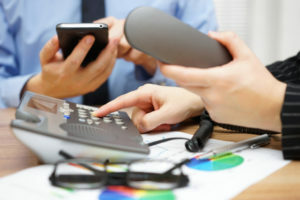 Connect from your desk, or on the go with VOIP Solutions from Active Telephone & Data. Just so you don’t think we’re highlighting the positives, we’ll also present some of the challenges associated with integrating VOIP phone systems. Instead of copper cabling used in landmark phone systems, rely on your internet connection. With signal strength varying from location to location, weak connections can be overcome with super fast fiber broadband. However, not everyone has access to fiber yet. VOIP can integrate with some existing business tools, but not every system integrates. Seamless integration with multiple tools can be a challenge. To maximize the benefits available through any telephone system, be sure to approach the transition strategically. Solving for one problem can oftentimes create others in alternate areas of the business. Employing over 85 years of Communications Experience in the business sector, Active Telephone & Data can solve your traditional hosted and virtual PBX systems as well as your IP integration problems. Just Call!